Let’s talk about expectations. Black Prairie is a five-piece band whose main instruments are dobra, guitar, fiddle, string bass, and accordion. They record on the Sugar Hill label, and Sugar Hill has a long reputation for bluegrass music. There is some of a bluegrass feel on some songs here, but it would be best to put those expectations away. Black Prairie is a band that includes three members of the Decemberists and two of their friends. So smartly literate songs with a strong folk influence and tight storytelling might be the order of the day. You had better put those expectations aside as well. What Feast of the Hunter’s Moon offers is something else entirely. Black Prairie was originally conceived as an instrumental band. They had been together, working out their sound for a while, before they decided that it would be a shame not to feature the wonderful voice of violinist Annalisa Tornfelt. So nine of the album’s thirteen tracks are instrumental, while Tornfelt sings four. I started this review by saying the band had a fiddle, but I just called Tornfelt the band’s violinist. Which term fits? It depends on the song. Some of the songs have a pronounced classical feel to them, and the musicians all prove perfectly capable of pulling this off. Feast of the Hunter’s Moon opens with a drone, played on accordion and bowed bass, which sounds like something out of Eastern music. This soon settles into a tune, Across the Black Prairie, which has a sort of jazzy folk feel to it, ala David Grisman’s work. But the song retains the eerie feel that was set up by that opening drone. The album closes with a tone poem, The Blackest Crow, which is actually a traditional tune, and is one of the vocal tracks. The playing and singing do not set up a rhythm; rather the song modulates as it goes along. Now you know, anything is possible here. Leave your mind open, and let Black Prairie take you where they will. Toward the end of the album, you’ll find, in Home Made Lemonade, some of that bluegrass feel you were looking for, but there’s a break in the middle where it almost becomes a classical piece, before returning to the original theme. Crooked Little Heart will give you some of the kind of songwriting you wanted, but, pin me down and I will call the delivery on this one jazz singing; not quite right, but I have to call it something. The classical influence is strongest in Ostinato del Caminito and Tango Oscuro. These pieces have distinct sections, but also coherent musical ideas that tie each of them together as a single piece. All of these diverse influences could make for a scattered mess of an album, but that doesn’t happen. Feast of the Hunter’s Moon comes off as the work of fine musicians who are bursting with ideas, but who keep it all together. The making of the album must have been an exciting voyage of discovery for the musicians; it certainly is for the listener. So come in to this one expecting a high degree of musicianship. Expect abundant musical imagination. And expect to be amazed. 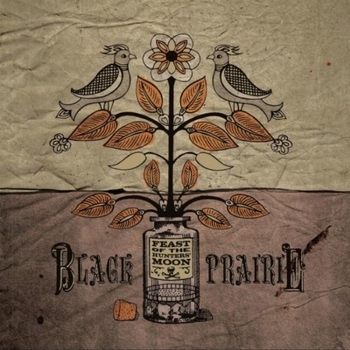 Black Prairie came about as a side project, while the Decemberists were on hiatus. I really enjoy the Decemberists, and look forward to more albums from them. But now I also hope there is time in the future for more from Black Prairie. I want to see where that imagination will lead them next.